Breathtakingly beautiful fairytale mansion. 3 sprawling lush acres w/approx 12,453 sq. ft. interior, nestled in prestigious E.H. of Englewood. Sweeping driveway w/archway to picturesque courtyard ushers you into this architectural marvel! 1st fl of sheer opulence boasts great room/FPL, banquet-size formal dining room/FPL which opens to a fully equipped butler's pantry & sun room, modern kitchen & bkfst room w/dual floor-to-ceiling FPL, garden room revealing a magnificent outdoor pool & stone/brick patios, exquisite powder room. 2nd floor features master suite/FPL w/dressing room/office & luxurious marble MBTH; 2 add'l BR's & 2 full BTH. Separate 2nd floor wing w/2 BR's, office & full BTH. Impressive 3rd floor is replete w/billiard room/FPL, 3 BR's & 2 full BTH's. Laundry, 1/2 BTH, wine cellar area & ample storage in basement. Meticulously sculpted gardens 4 car garages. 3 BR Carriage House. 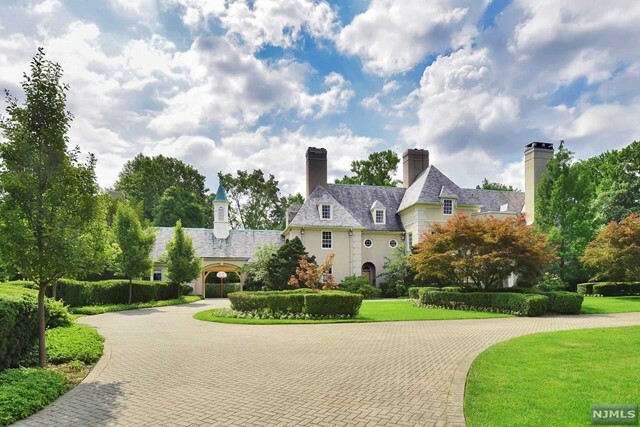 This amazing compound is only minutes to GWB & NYC. A truly once-in-a-lifetime opportunity!